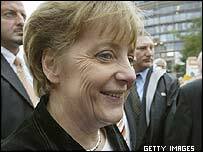 Germany's Chancellor Gerhard Schroeder and his conservative rival Angela Merkel have held a meeting over who will lead the country in future. They left a four-hour meeting on Thursday without commenting. A final decision is not expected before Sunday. Mr Schroeder's Social Democrats (SPD) are moving towards a coalition with Mrs Merkel's Christian Democrats (CDU) - but both leaders want to be chancellor. The CDU emerged only slightly ahead of the SPD in the 18 September election. Neither party was thus able to secure a working majority with its preferred coalition partners, opening the way for a so-called "Grand Coalition" of the two main rivals. Such a formulation would mean the two parties governing together without needing to call on smaller parties for support. The issue of who would lead such a coalition has however proved a major point of contention. Mrs Merkel told a news conference in Berlin: "I have informed [the party executive] there will be further decisions made in the leadership talks and also said that there will probably not be decisions from these talks before Sunday evening." Mr Schroeder has said he will step down if his party says he should do so. So far the SPD has insisted it has the right to head any future coalition.